Tom Cruise to the Rescue! Obviously when I was diagnosed with AML it didn’t just affect my family; my friends were also deeply upset. After speaking to a couple of my friends recently I decided that their stories would make a valuable addition to my blog. So here is my first post from my friend Jane whom I’ve known since childhood when we met at Dance School! One Sunday, last spring Louth and London were having a catch up phone call. Anna and I were chatting, concerned about one of our best friends whose sibling was battling cancer. Little did we know at the time what was happening inside Anna’s body! We nattered away, Anna also let me know of her husband’s charity cycle ride in London when they would be joining him for the weekend in the coming summer so I made a note of the date. During our conversation Anna mentioned how she’d been feeling unwell recently but, hadn’t been able to put her finger on what it was as it didn’t seem to be anything specific. She thought she was bit run down, overdoing things and that she was going to see her GP the next day (Monday). The next day, via our usual WhatsApp ‘old school mates’ group we get a photo from Anna of her hospital room with the caption ‘My view this morning’. She had been rushed into hospital the night before and was undergoing tests, we waited to hear what was wrong. Then the news came…Leukaemia! What?! Stunned, shocked and frozen with fear for Anna and her family our group of friends were knocked for six. We were phoning from London to Louth to Australia with our friends there ready to jump on the next plane home! I didn’t know what to say or do, so many questions, what did this mean for Anna? I had heard of Leukaemia but hardly knew anything about it and initially I was too scared to ‘Google it’. I knew some friends had Googled it straight away and it is rare for someone our age, we had all been planning our 40th birthdays and suddenly this had hit us! During the days, weeks and months that followed our group kept in contact with updates of Anna’s condition. From visits we’d made to her husband, Lee keeping us informed. I visited Anna on several occasions and as I write this now I have tears in my eyes having witnessed what she went through. I often hoped for a glimmer of our mate in between bouts of consciousness, willing her to pipe up with all the talk she is always so full of. One of the toughest things for Anna in the early stages was the thought of loosing her hair. We knew that throughout our years of growing up together how she was always ‘growing her hair’ it was never long enough, she always wanted it longer even when it was long! July and the London bike ride came up, I kept the date free with the hope Anna would somehow be strong enough. But the timing wasn’t to be with her cycles of treatment so with Lee already committed to the event meaning he and their daughter would be in London. It was also the time when her Dad had been taken into hospital so her family would be split between caring for Anna and visits to him in Hull which was a 3 hour round trip. I offered to stay with her and ‘Anna sit’. I knew Anna would be tired most of the time but I wanted to be there for her anyway and look after her. We called it our ‘Tom Cruise’ weekend as it happened to be back to back Tom Cruise films on TV, both of us being fans of Mr Cruise this was spot on for us! Anna slept on and off and I felt comforted that she was able to rest. Watching these films together was a very special time and I like to think Tom Cruise came to the rescue and gave us a little escapism from the harsh reality of life at the time! Why else were there back to back Cruise films on TV that particular weekend?! We spent some time with her Mum too as her Dad was in hospital, we took fish and chips round to her Mum’s one evening, we were all so pleased when Anna ate a plate of chips! As she’s had very little appetite this was a relief to see. 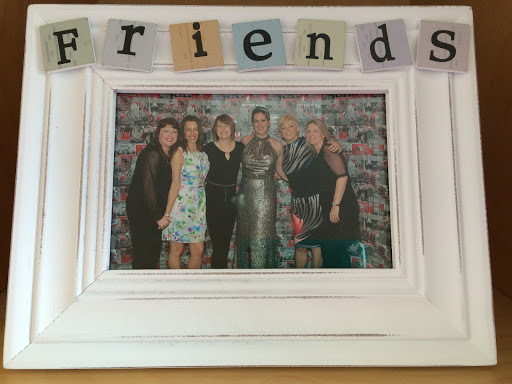 November came and it was time for Anna’s 40th birthday party, an emotional occasion but we celebrated in style! Anna has come so far and looked absolutely amazing, it was wonderful to see her with her family and friends being the belle of the ball. I am in awe of Anna’s strength and bravery, her enthusiasm is admirable. She is embracing this life changing experience and turning it around to raise awareness and offer support to other sufferers. I am excited to hear of her new ventures and look forward to seeing them flourish. Having known Anna since our childhood, from our involvement with the local dance school to her Dad being my Art teacher at secondary school. I am proud to have you as my dear friend, I know that part of you is now a ‘new Anna’ but, you will always be ‘our Anna’ to me. Our ‘old school chums’ at Anna’s 40th birthday party! Previous Post Not Always Happy Anniversary! Love you both soooo much.